Back in 2010, the U.S. Coast Guard Auxiliary warned boaters about the damage that ethanol-blended gasoline can produce on boat engines. Despite this warning and many others from boating organizations, boat engine manufacturers, and boat dealers, some boat owners are still unaware how ethanol-blended gasoline hurts their boats. Although ethanol gas reduces dependence on foreign oil, supports the agricultural industry, and produces three to four percent fewer greenhouse gas emissions, it also can attract water to a fuel tank, causing a sludge that can destroy an engine. Why is this problem pertinent to boats, but not to automobiles? The difference between using ethanol-blended gas in cars and boats is that individuals often use their cars more than they use their boats. This lack of use is hitting particularly hard in drought-stricken areas this year, according to some boat dealers. Depending upon the size of the boat motor, the damage caused by failing to use a boat that runs on ethanol-based fuel can tally into the thousands of dollars if that boat is not properly maintained. Additionally, boat engines contain vented fuel systems that allow moisture to enter fuel tanks. When the alcohol in the E10 (10% alcohol) gas blend sits idle in an engine, it absorbs moisture from the atmosphere — in fact, it can absorb up to 50 times more water than non-alcohol gas. After sitting for a time (90 days or even less), the water and ethanol mix separates from the gas and sinks in the fuel tank (phase separation) to create a milky-brown substance that can cause boat engines to misfire. Misfiring is just the first sign that something might be wrong. According to Fuel Testers, “Phase separation occurs in E10 gas, when only 0.5% water or 3.8 teaspoons water per gallon of fuel is absorbed.” Even if you’ve had your boat out every day this summer instead of laid up in dock, E10 gas can dissolve up to 6,000-7,000 parts per million (PPM) water at 70 degrees Fahrenheit. When this blend cools, the water and some of the ethanol become insoluble, creating problems from the get-go. Since ethanol is a solvent, it also can soften rubber hose interiors, breaking pieces off that can clog the fuel system. If you own a boat with a fiberglass fuel tank, the ethanol can dissolve the resin that holds the material together. That material, also, can head into the engine. It can also dissolve plastic, rubber, and aluminum parts, dry out hoses, remove lubrication, and shrink or swell engine seals. The best thing for you to do is to be aware of your manufacturer’s warranty for your boat and be aware of where you’re gassing up and what gas you’re using for your boat. If that warranty forbids using all ethanol and “gasahol” fuel and you use it anyway, you may end up being responsible for damages. Once E10 begins the phase separation in a tank, there’s little you can do to repair that damage, despite claims that you can repair phase separated fuel. Even winterizing a boat that uses E10 can prove a nightmare for boat owners, because it’s rare that you can completely empty a fuel tank. If you can siphon the tank or pump it dry from the fuel line, you might get professionals to buff the interior of the tank to remove any loose particles that could clog the engine. Additionally, be aware that water-separating fuel filters can become clogged when using regular gas, let alone E10, so carry a few with you when you’re out on your boat. Some states mandate E10 fuel, so there’s not much choice in the matter when it comes to fueling your boat in those states other than to purchase a boat motor that tolerates alcohol-based fuel. Other states still offer ethanol-free gasoline, which is a preferred choice for many boaters. Since hot weather accelerates deterioration, it’s not surprising to find marinas in the south that still carry the option for non-alcohol gasoline. While some boat engines are compatible with E10 fuel, some manufacturers still warn about outboard fuel systems that can sustain damage from that fuel choice. The problems that arise usually come at the fuel station, when boat owners are distracted or tanks are not labeled correctly — in fact, the Marine Retailers Association of the Americas (MRAA) warns that many consumers fuel their boats when they fuel their cars, and confusion over mislabeling gas or lack of consumer awareness may end in destroying a boat engine. Read your boat engine warranty so you know what fuel you need to use for your particular engine and boat. Maintain your boat as well as you can to avoid any E10 fuel damage. This maintenance includes any additives you may need to keep the E10 fuel fully integrated and to reduce the fuel’s ability to absorb water and separate. Remember — if that fuel has separated already, no additives will repair the fuel itself. Empty the fuel tank, clean it out, and refill with fuel covered by your warranty. Address your problems quickly, including replacing any fuel lines, gaskets, or any other worn or affected parts. Always fuel your boat at a marina. Use regular gasoline if you have that choice. 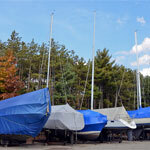 Finally, you might want to read your boat insurance policy again, because no two policies are the same. Don’t accept a policy that leaves you uncovered. Contact United Marine Underwriters about your boat insurance needs, because we offer the best rates from the best companies for the most complete boat insurance. One facter you missed while discussing E10. If an auto tank starts to leak it drops to the ground and evaporates on a boat it drips into the bilge and fills same with fumes. Be sure to clear the bilge before you touch the key. Great comment Fred. Thank you. Great article on veggie based ethanol. Too late for me though, just got towed back by our harbormaster. I have 185 gallons of the stuff, and it just destroyed my 225hp engine. Many thanks to Bush and the big farmer lobbies. I use StaFlo in my 6 cylinder Mercury. Runs great. When I forget to add….runs like crap and sometimes has difficulty starting. I purchased a used boat last year. The fuel seperated causing me to have to have three hunderd gallons of fuel pumped out and disposed of. Once seperation starts nothing will fix it. I would recomend anyone buying a boat with large tanks to have the fuel tested.The government needs to give up the ethanol idea. How is StarTron for the outboard engines? I use it in my Yamaha 225 4 strokes. I live in NJ and have never seen non-ethanol fuel offered anywhere around here. Is it offered all over the country? Is gas sold at marinas non ethanol fuel? We just spent a week at Raystown Lake here in PA. I filled at the gas station before we got there and my friend decided he was going to buy gas at the Marina where we were staying at. When he went to fill up the pumps at the Marina had 10% ethanol added. He got the same gas as me but just ended paying $.80 a gallon more. I have been told that once you use E10 fuel that you can not start using non ethanol gas because the non ethanol gas will “clean/strip” the residue that has built up in the fuel system. However, if you use non ethanol fuel converting to E10 is not an issue. Is there any truth? I’d love to switch to non ethanol gas which is available on the Eastern Shore of VA but I’m concerned about the effects. Thanks. Thanks to our illustrious federal government that have their own fingers in the gas business. And the liberal EPA. What do they care? If they would get their heads out of a dark place where the sun doesn’t shine, they would realize that good gas is the best choice for everyone, and everything! Something else to remember—-without ethanol to raise the octane, 87 octane would be the lowest the refiners could produce. Right now refiners are able to produce sub-octane 84 or 85 octane that needs help. Refiners are also able to pass off more nasty molecules, I think aromatics and maybe benzene that they couldn’t without ethanol. That would mean less gasoline could come from a barrel of crude. More crude needed should raise prices I think. Mike Hammond, Can you explain the difference between corn ethanol and petroleum ethanol? Aren’t they both C2H5OH. By the way, I’ve been using E50(50% ethanol) in my unmodified 1992 Toyota 4×4 22R-E for 11 years and sometimes it takes months to burn through a tank. So far it still runs great!!! How about some detailed information with regards to fuel stabilizers additives. Many are sold and claim to help correct the problems caused by E10 fuel. Go to http://www.lubedealer.com/wamiller to get information about fuel stabilizers and additives. If you are a boater take a look at the information about QUICKSHOT. There are several products at this website that you can get detailed information about. Simple solution: DON’T USE BLENDED FUEL !!! It costs more but it’s much cheaper than engine repairs. That is a great answer! I wish that I could. Where is there a fuel station that doesn’t carry pre-blended fuels? I live within 20 miles of the refineries that produces 85% of the fuel that is consumed by the people in the US. But as far as I know, there are no stations, or fuel docks that provide the option for a non blended fuel. But I do feel like we should have that option. Do you have a Fast- Trac station near by? They sell Non Ethanol 92 octane. Two more things. Motorcycles and scooters are also affected and the price of every thing that has high fructose corn syrup in it has gone up. water in production. How des that fit in with increasing droughts in the corn belt. What about the additives that are suppose to the E10 from messing things up? I have found a product made by AMSOIL that addresses the problems that you will have with E10 fuels. Also stabilizes fuel between uses and during short-term storage periods. Quickshot is the product name that AMSOIL offers for protection in your 2 & 4 stroke engines. Good boating. Why has it taken so long for this to come out? I had worked in the oil patch years ago. And the place that I worked was Ethyl Corp. That is the place where petroleum based Ethanol is manufactured as a gasoline additive. Here are the facts. We have been using ethanol-based fuels since the 50’s. It has been an additive in gasoline for as long as I can remember. The problem arose when we started using corn for the manufacture of ethanol in gasoline. That is the problem. Petroleum based ethanol is not and has never been a problem in gasoline. As a matter of fact, it is useful in zapping moisture in fuel as well as providing the octane increase for hi-performance engines and for boats. If you check the requirements for aviation fuel, corn based ethanol is restricted from use in airplanes. Why? Because the FAA knows that it is a problem and doesn’t want the bad press of planes falling out of the sky because of the manufacture of bad AV fuel. The reason we don’t see these problems in automobiles as much is because most people will burn through a tank of gasoline before the ethanol starts breaking down and creating the problem. Between 7 and 10 days the corn based ethanol breaks down and congeals. During this same time it forms a brown sticky varnish like substance on the interior of the fuel system. This brown sticky substance attracts any solid contaminants that may be in the fuel system and causes those contaminants to adhere to the affected area. This ultimately will cause a failure of the fuel system and it’s components. There is a purpose and a place for everything. The use of corn-based ethanol should be restricted in any combustible engine where it is going to be sitting up for over a week. Engines that are use in boats and also engines for Lawnmowers, generators, weed eaters, Etc. The same lobby and lawmakers that pushed this legislation through needs to take a hard look and change the application of the type of ethanol in the fuels. Also, There should be a place where we as a consumer can make an informed decision to purchase the type of fuel that we need to. My 2009 Hyundai Accent got 36 mpg. I switched (forced to) E10 gas. Now I get 30 mpg. If my milage goes down by 20% with 10% Ethanol how is that saving the planet or dependance on foreign oil? It used to cost me 5 gallons af gas to go 180 miles. Now it costs me 6 gallons. If those 6 gallons are 10% ethanol or .6 gallons then I’m burning 5.4 gallons of gas to go the same distance I used to go for 5 gallons. Doesn’t that extra .4 gallon come from foreign oil? Hi, I agree totally, last year the ethanol in the fuel ruined both carburetors on my Twin 7.4L Mercuiser engines.. One of them was an emergency repair while traveling costing $500 including Labor . For the other carburetor I went on line an found a rebuild kit which was easy to install and very low cost . Now I keep one Carb spare. It seems that the rubber seals eroded on the inlet needle seat allowing too much fuel to enter the carburetor while idling causing the engine to flood and then stall.. Very hard to start after stalling . Since then I stopped using Gas from the Street and went with the Valve Tec Fuel Found at some Marinas on the Bay . It is worth the extra money per gallon and you do not need to purchase the Additives! I just hate to think what the ethanol fuel is doing inside the metal fuel tanks. Thank you Government at your desire to blow up small engines. I understand it takes 1.30 dollars in regular carbon based fuel to make 1.00 dollars of ethanol. Anyone wonder why we are going broke? i had a “water/oil” separator put between my tank and 2000, 200 HP V-tech yamaha. seems to be working quite well….so far. as we all know, b.o.a.t. stands for “bet on another thousand”. i live on the lower bastrop bayou, near christmas bay, on the gulf. 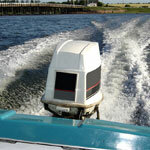 one more bit of advise…..buy an engine cover if your boats in a sling. you’ll be glad you did. good fishin’ to all. as always, billy ray “on da bayou”, y’all.